IT IS TIME! Shameless comic selling time but also we finally have dates! Issue 7 is now up for presale, along with all other issues. We've got the standard version, and a special edition of it available that comes with a bookmark, 2 print set, a sticker sheet, and an original, signed sketch! We've also got pre-orders available for all the other issues as we were out of a bunch of them. CHECK OUT THE PRE-ORDERS HERE! And the big news! 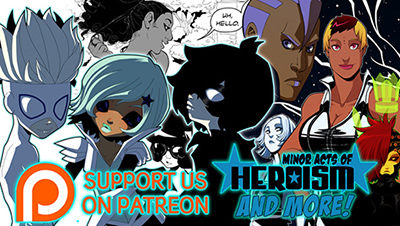 We'll be starting the next part of Minor Acts of Heroism on March 16th, so please save the date and come on by the site to check out the new comic on that day. Thanks so so SO much for all of the love and support and endless patience you guys always offer! We know we're slow and we SUPER LOVE you all for waiting for us! Shop update and soon a new chapter! It doesn't get any better than this! Thank you! OMG OMG NEW PAGE NEW PAGE ITSANEWPAGETHISISSOAMAZING-wait. Is that Zakris? And...he's pink? Well. I guess that makes sense. Huh. Thank you! Thank you!Thank you!Thank you!Thank you!Thank you!Thank you!Thank you!Thank you! I so needed a fix. OH MY GOSH NEW COVER!! OH MY GOSH IT'S ZAKRIS!! Day made. :D I'm so happy to hear that you're coming back soon! ^^ You guys rock! Best wishes for the future! @oftheWood We won't be at Sakuracon this time! I just cried at you in instagram!!! hohhh boy im so behind on this comic. but ima catch up like nobodys business. just you watch and see!